Late Senator Benigno Aquino III before his death, said that he was all for the unification of the state with the National Democratic Front and the New People's Army and the legalization of the Communist Party of the Philippines. This were his statements in a speech during the time of martial law, when he was leading the opposition by the Liberal Party against then dictator Ferdinand Marcos. The NDF is the military arm of the CPP , and the NPA has also associated themselves with the organization. 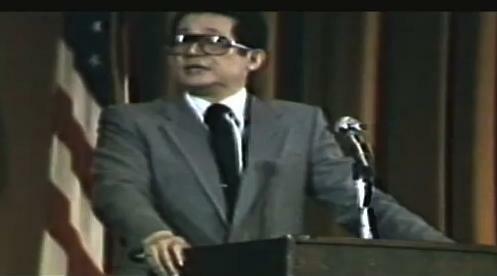 A video of an excerpt of Ninoy's speech was shared by the Facebook page Maharlika. "I've said in many of my writings that National Democratic Front, specially it's militant arm, the New People's Army has been an instrumental in many social changes in our country. There maybe a difference in ideology in approach but we are united in one, we are united against the dictatorship. My position is very clear, If we will succeed in overthrowing the dictatorship, we should allow every voice and every idea to ventilate their views in the public market. WE SHOULD LEGALIZE THE COMMUNIST PARTY OF THE PHILIPPINES and give them exactly the same forum to expound on their ideas." At present, President Rodrigo Duterte also has an on and off relationship with the CPP. On December of last year he signed a proclamation declaring the CPP-NPA as a "terrorist group". On January of this year, he has vowed to "crush NPA and CPP in all legal fonts". However, on April 4, he ordered the resumption of peace talks with the CPP, NDF and NPA.